Benelli began in 1911 as a family repair shop for motorcycles and bicycles. 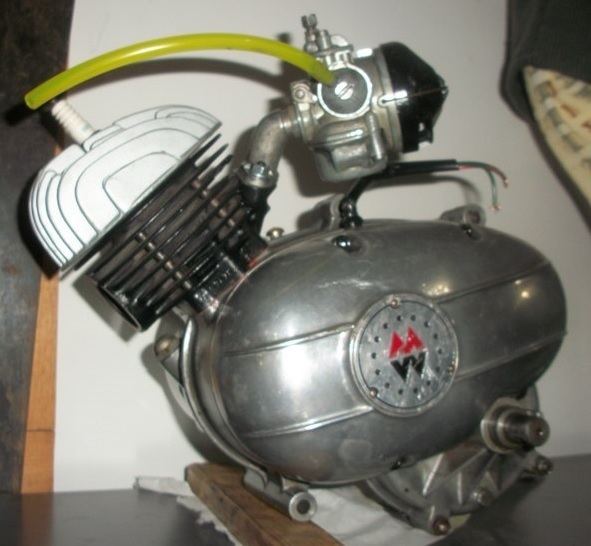 By 1940 they made a winning supercharged 250cc 4-cylinder racing motorcycle. So they are to be admired like Ferarri and Ducati are. Motobi: In World War Two the Benelli factory in Pesaro Italy was totally destroyed. After the war the factory was rebuilt, but there was discord between the six Benelli brothers. In 1949, Guiseppe Benelli left to form his own company, Motobi. After 13 years of success, Motobi was failing financially, and in 1962 was acquired by Benelli. The combined Motobi-Benelli company produced around 300 motorcycles a day and had 550 employees. 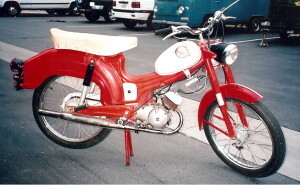 Motobi designs continued in production under the Benelli name. After 1962 both names were used by the same factory, Fratelli Benelli S.p.A. Pesaro Italy. See more at Wikipedia.org. 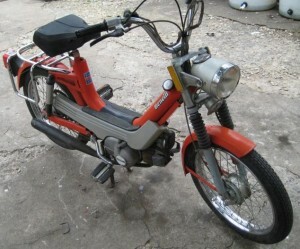 1978 Moto Guzzi, made by SEIMM Co.
G2 means Gentlemen Due. It supersedes the 1960’s Gentlemen 1 (and 4). The Benelli G2 and the Moto Guzzi (mono-tube-frame) are identical twins. See Moto Guzzi. SEIMM: The late 1960’s and 1970’s were hard times for European motorcycle manufacturers. Low cost and high quality or higher performance machines from Japanese makers took away millions of sales from European makers. SEIMM (Società Esercito Industrie Moto Meccaniche) was an Italian government controlled company that would take ownership of failing Italian motorcycle manufacturers. In the 1950’s and early 60’s Benelli and Moto Guzzi were competitors that made similar products. But in the hard times of the “Japanese invasion” they were partners, and shared their rights and resources. That is why the mopeds are identical. 1981 laws for manufacturers came into effect for motor vehicles worldwide, made after 1980, including the 17-digit VIN, and noise labeling. 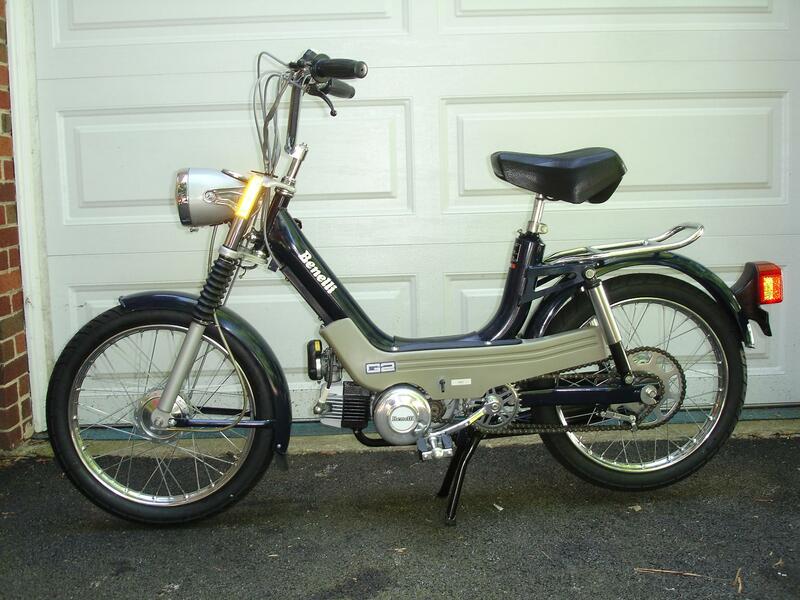 Like most other moped makers, to avoid the hassle, SEIMM made and stockpiled 2 or 3 years worth of 1980 models, and sold them in the following years as 1981 and 82 models. 1970’s moped engine: 1977-80 Benelli G2, 1976-77 Benelli Blazer, 1978-80 Moto Guzzi, and 1977-80 Moto Guzzi Robin, all have the same 25mph horizontal cylinder one-speed automatic moped engine from about 1970, with a Dellorto 9mm sipping straw. They all have the same wheels and dual-left-chain drive. This engine does not have built-in pedals. 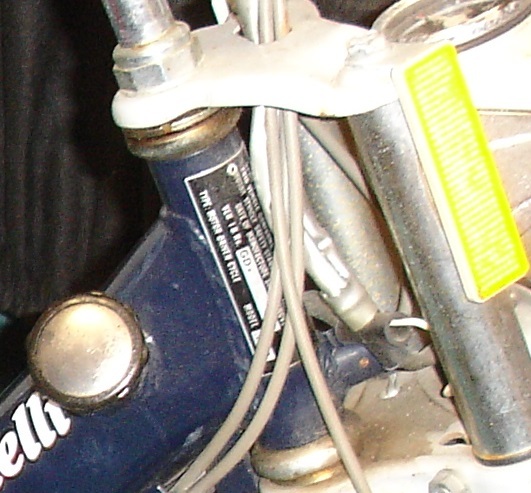 The external pedal system is unusual with both pedal and motor chains on the left side. Most bicycle chains are on the right side, so a special reverse or “left hand” freewheel is required. 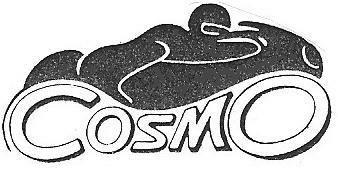 Cosmo: Benelli mopeds and motorcycles were imported to the USA in the 1960’s and 70’s by Cosmopolitan Motors in Hatboro PA. Cosmo sold the G2, Blazer, and C2 (a long seat version of the G2). 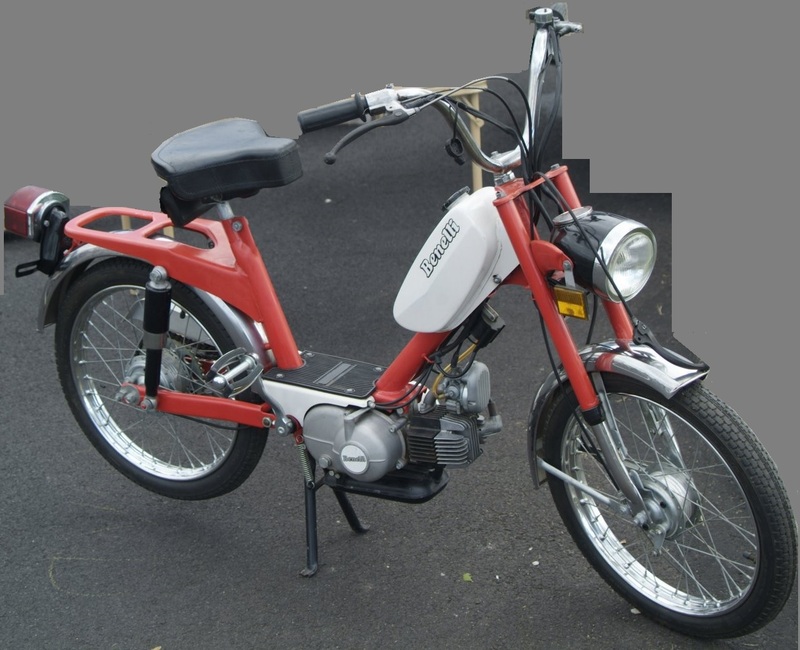 They also sold Benelli mini cycles and trail bikes (see below), plus Benelli 250 and 500cc 4-cylinder and 750cc 6-cylinder sport motorcycles. Vroom! Officine Benelli: Here is a link to the official Benelli website-museum, 1970’s mopeds. The Benelli Blazer is made by Motobi (Benelli). It is like a G2 but with a standard tube frame with separate gas tank. 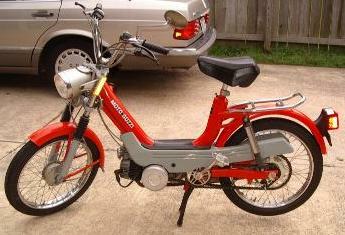 The European version of the Benelli Blazer is called Benelli Bobo. Compare the 1977 Blazer engine with the 1969 Maverick. Benelli G2 components: 2.25-16″ tires, Benelli one speed automatic engine, Dellorto SHA 14/9 carburetor, #44 jet. Dansi 101813 magneto (external ignition ground type). CEV 2139 bullet head light, CEV 9400.2 tail light (with resistor for external ignition ground magneto), CEV plastic slide clamp-on switches, PV controls, Grimeca hubs (rear hub is special, Benelli only) and brakes, Veglia speedometer with LH driver, 12×1 female gas valve with special long detachable shaft that goes through a hole in the side panel. Fratelli Benelli S.p.A. one speed automatic engine is shown, mostly for info purposes. You can see what and where everything is, at least. Myrons Mopeds does not have many Benelli-specific parts, but does have most things that are the same as other late 1970’s Italian mopeds. 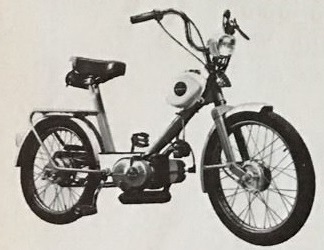 Montgomery Wards (MW) was one of the three major US department store chains that sold motorcycles, scooters, mini-bikes, or mopeds, in their catalogs and stores. The Wards line was named “Riverside”. The earliest Wards Riverside models from the 50′s and early 60′s where French-made Motobecane mopeds that consisted of models like the AV88 and AV78. There were also some scooters made by Japan’s Mitsubishi and Italy’s Bianchi companies. In 1965, Wards changed manufacturers and opted to sell mostly machines from the Italian company Benelli. 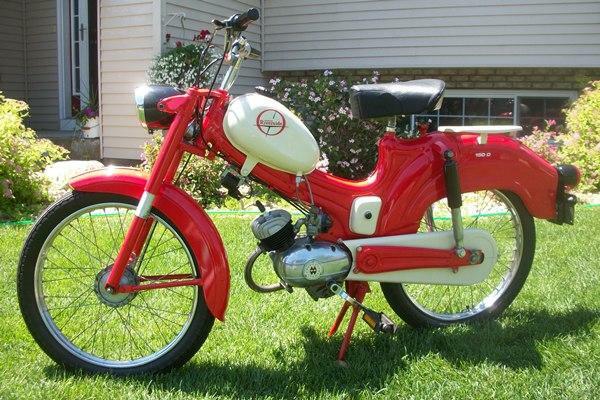 Benelli offered not only a few different moped models but also a line of 2 stroke/single cylinder motorcycles that could compete in the marketplace with the Austrian Puch motorcycles that Sears was selling under their Allstate brand. 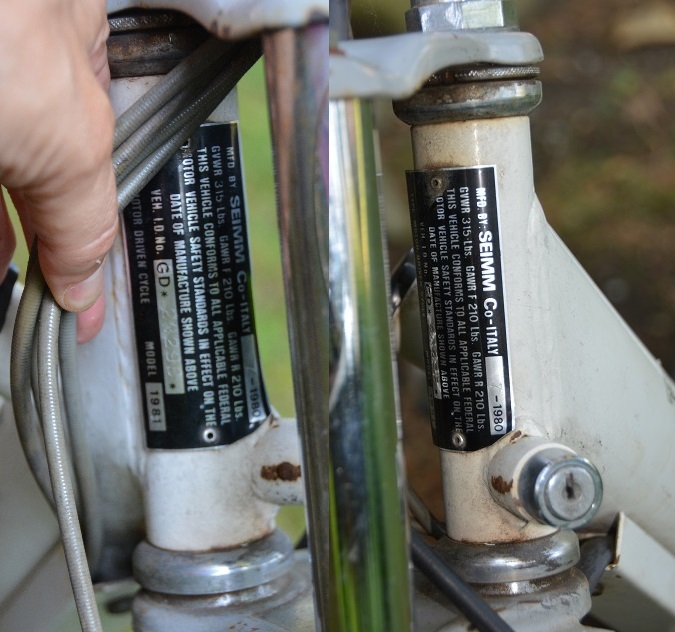 The 1950’s to 1960’s moped motor had an upright slanted forward cylinder, not horizontal like the 1970’s moped motor. The 60’s motor was rounded everywhere, not mostly square like the 1970’s motor. There was a single enclosed left side drive chain, not dual chain. The pedals were part of the motor unit. The Benelli MW 50cc cylinder is the same as the Benelli Fireball 50cc cylinder, except the porting. 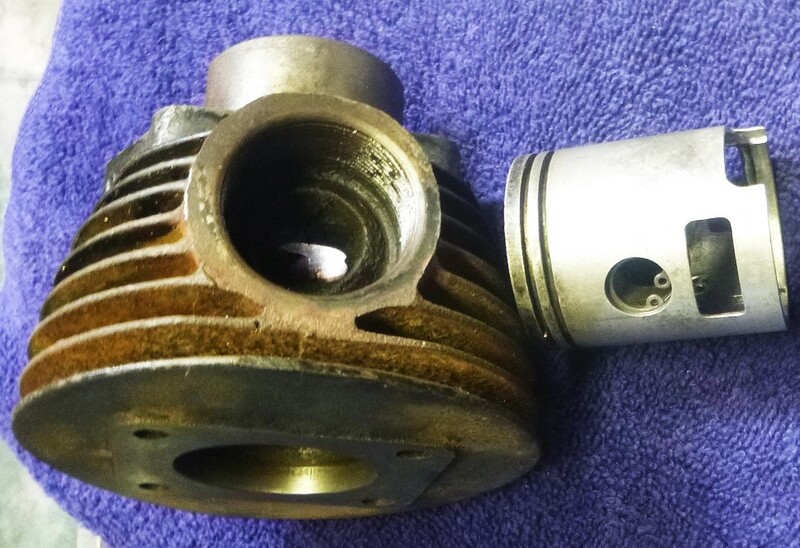 The Fireball cylinder has a 17mm (for the Dellorto UA16 carb) intake port at the flange, while the MW cylinder has a 10mm intake port hole (for a Dellorto 14/9 carb). The exhaust port is taller and wider on the Fireball. The transfer ports and intake port are also wider and maybe taller. The 1960’s Benelli MW piston is the same as the 1970’s Benelli G2 piston. They are both 40.0mm bore, and use the same rings 40 x 1.5 FG. 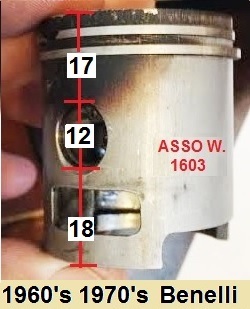 The exhaust has a screw-on mount, with M34-1.5 male thread on the exhaust, female on the cylinder. 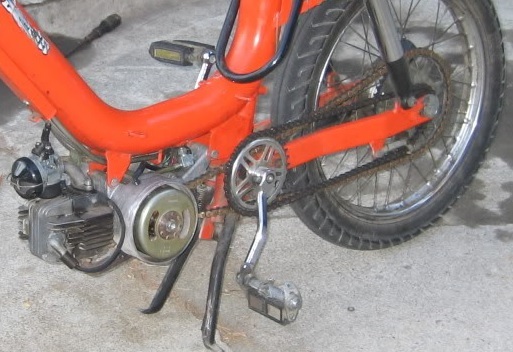 Some parts of this 1960’s moped motor was used in some of the Benelli mini-bikes. The right side pedal shaft had a kick start lever, and the left side went into a kick-start compartment, with a ratchet and return spring. So the transmission and pedal or kick starter were different. You are currently browsing the archives for the Benelli Parts category.